Ultra-Wideband positioning: How does the drone know where it is? Welcome to the first Basics of Technology article! In this series, we show readers all the technologies that Blue Jay needs to function, and how they work. In this post, we will show you how Blue Jay uses Ultra-Wideband to determine her position. We have received the Ultra-Wideband system from Vention spin-off Focus. So why do we use Ultra-Wideband? Well, we want Blue Jay to be able to avoid obstacles when she is flying somewhere. To do so safely, she needs to know her own location first. For example, we want her to know where the walls are in a certain building, so she can avoid a wall-hugging accident. If she does not even know her own location, this information is useless to her. Because of this, using Ultra-Wideband is, for us, the first step in creating the indoor drone of the future. Fig 1: Blue Jay is happy to know she is not going to hug a wall anytime soon. But what is it? Allow me to explain. Ultra-Wideband is a technology that enables both outdoor and indoor positioning. For example, you could think of a robot helping out in a warehouse. To be able to help move packages around in this warehouse, the robot has to have an idea of its position. This is where Ultra-Wideband shines. By using this technology, the robot is able to know where it is very precisely. Here is how it works. The Ultra-Wideband location tracking system consists of three different types of devices. 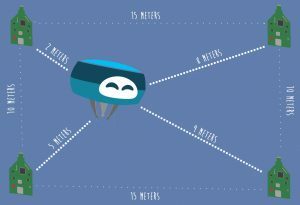 To achieve the goal of telling the robot its location, they work together very similarly to the way the navigation in your car works with GPS. 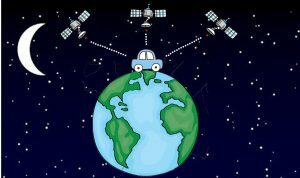 GPS works because satellites know their own location, and are able to measure the distance to a car by measuring the time it takes to send a message to the receiver. Doing this with multiple satellites simultaneously, makes it possible to calculate the location of your car, using trilateration. Fig 2: A car knows its location with some help of satellites. In the Ultra-Wideband system the satellites are called ‘anchors’. These anchors first need to know their own location in order to be able to determine the location of what is tracked, the so called ‘tag’. Fortunately, we do not have to go through a time consuming process of measuring all the anchor distances ourselves because it is managed by the system. We put up the anchors around the space Blue Jay will be flying, and the anchors determine their own location relatively to each other. We also define the grid we want to use and automatically a map is created. Blue Jay is equipped with not one, but two tags. This way we do not only know her exact location, but also which direction she is facing using the orientation of the two tags. The location is then shared with Blue Jay and with us, using the third device: The ‘access point’. The access point is the manager of the system and allows us to interface between the system and our computers. The Ultra-Wideband system we use allows for countless possibilities. At Focus, a Vention spin-off, they developed the system specifically for use on stages for artists. You would not think of it, but having a spotlight follow artists on stage is harder than it seems. Often this is manually done or pre-programmed such that the artist has no freedom of movement anymore. By implementing the Focus system, the artists location is tracked automatically and translated to a pan, tilt, zoom and focus of the spotlight. Plugging this directly into the lighting engineers console results in automatic following the artist with your spotlight. This way light engineers and artists can focus on what they do best: Entertain their audience!